Sunday evening services at Kirkbymoorside take a different form from morning worship and are more reflective and informal in style. On the third Sunday our evening service is an informal service of Holy Communion. We usually sit in a semi-circle and services may include listening to reflective music, a meditation, discussion, or perhaps silence. Our ‘FAITH and FOLK’ evenings are held on the first Sunday of the month and our aim is to be open, flexible and inclusive. There is plenty of opportunity to chat or just listen to music on CD, enjoying the relaxed atmosphere, whilst light refreshments are served, from 6.30 pm onwards. From 7.00 pm, songs, stories, poems and prayers (and occasionally, dance) are shared in an informal act of worship, lasting about 40 minutes, in a relaxed, café- style atmosphere. Musicians and singers (and non-musicians!) are invited to join in and percussion instruments are to hand (for those with a sense of rhythm!) 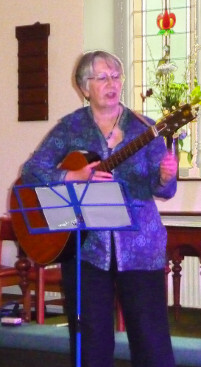 Each ‘Faith and Folk’ evening has a particular theme (such as ‘Journeys’, ‘Light’, ‘New beginnings’) and is advertised locally and on the Circuit website. Anyone may contribute a song, instrumental music, poetry, prayer or reflection relating to the focus of the evening. Some ‘Faith and Folk’ evenings feature a spot by local musicians, singer/songwriters. Come along – and bring a friend, or two!